If you’ve ever wondered what sort of amenities the super wealthy are able to offer their cats, this week’s NYT’s article “Life in a Belgian Water Tower” can give you a few clues. Our cats would go berserker over that living room tree. 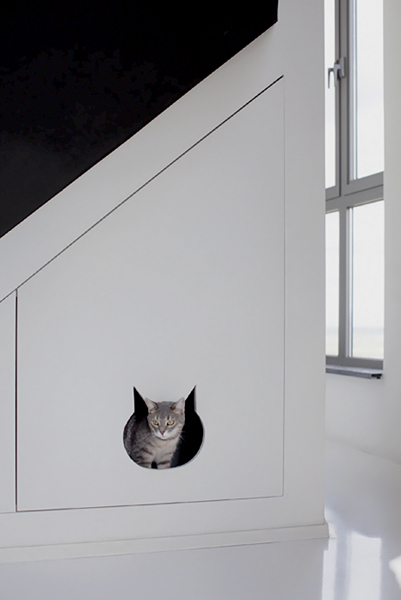 The New York Times calls the area in the second image a “compartment,” but you and I know it’s a fancified cathole. No matter how rich you are, having a cat means keeping a box of poop in your house. Have a good weekend, folks! Heads up to those of you who follow my blog via RSS: I’ll be doing some website maintenance over the weekend which, I’m afraid, might lead to old posts reappearing in your feed. I apologize in advance. All our cats should be so lucky! Very cute.